All natural healthy grains & fruit. Heart healthy (While many factors affect heart disease, diets low in saturated fat and cholesterol may reduce the risk of this disease). Nothing artificial, real fruit pieces! Chunks of apples! Mornings never had it so good! 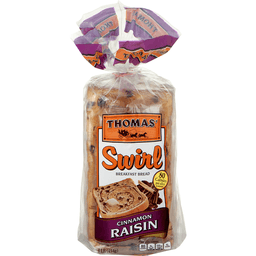 Great for: toasting; French toast; snacking; get-up-and-go goodness. Topping Suggestions: Serve warm and toasty, topped with almond butter! Enjoy! Ozery - that's our family name. We believe that good bread makes people happy. That's why we're always dreaming up new ways to make bread more delicious. We hope you enjoy our latest creation - Morning Rounds - as much as we do. 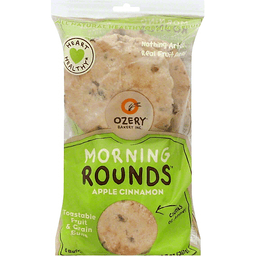 Morning Rounds Apple Cinnamon Buns are all-natural healthy grain buns full of dried apples and raisins, and sprinkled with a bit of cinnamon. They're delicious toasted, topped with your favorite preserves, or just by themselves - the perfect portable breakfast! Morning Rounds are crafted with care in small batches, and contain absolutely nothing artificial! Toll Free: 1-888-556-5560. Reuse & recycle. Product of Canada.